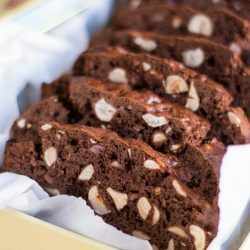 Easy gluten free Chocolate and Hazelnut Biscotti are the perfect last minute gift. Bake once, freeze, then bake again for gift giving. Line a 21cm x 11cm loaf tin with baking paper and set aside. Place all the dry ingredients in a large bowl and whisk gently to combine. Whisk the eggs and sugar together in a separate bowl. Whisk in the macadamia oil, coffee powder and vanilla extract. Make a well in the middle of the dry ingredients and pour in the wet ingredients. Stir to combine. You will have a firm dough that will not completely hold its shape. Add the hazelnuts and cocoa nibs and stir until evenly distributed through the dough. Turn the dough into the loaf tin and push into the corners. Bake for 35 minutes, or until a skewer inserted into the loaf comes out clean. Allow the loaf to cool in the tin for 10 minutes, then completely wrap the loaf (still in the tin) in foil. Allow the loaf to cool completely. Preferably overnight. If you wish to freeze the loaf, unmould it from the tin, rewrap it and freeze for up to three months. Preheat the oven to 150C (130C fan forced). Line a tray with baking paper. Remove the dough log from the loaf tin. Using a serrated knife, and working as gently as possible, slice the log into 1.5cm slices. Gently transfer each slice to the baking tray. Remove the biscotti from the oven and gently turn each slice. Bake for a further 15 minutes or until the slices are dry. Remove from the oven and allow to cool for 10 minutes before transferring the slices to a cooling rack. Allow to cool completely then store in an airtight container. The loaf will freeze, uncut, for up to 3 months. Allow to defrost overnight if possible before proceeding with the recipe. Gluten free biscuits will not act in the same way as their gluten cousins. I have not added any gums, commonly seen in gluten free baking, to these biscotti and as such they are slightly fragile and crumbly. Take a little care when slicing the loaf and you will be rewarded with intact slices. Cooling the loaf in the tin is a critical step in making these biscotti work so don't skip it. It is the moisture trapped in the tin that allows the loaf to soften enough that it will slice without crumbling immediately.